March 11-ish, 2016 – The City posts the Boulevard Gardening Guidelines to its website. It is now official, and easy for all to see: City policy encourages boulevard gardening in the City of Gardens (“for good”, not merely on an interim basis)! Many thanks to our Mayor, Council and City staff! Sharing space; sharing knowledge; sharing seed, food and flowers! We can do it! Feb. 25, 2016 (evening) – City Council unanimously approved the “Growing in the City” policy package (including the revised Boulevard Gardening Guidelines), and instructed staff to prepare associated Bylaw amendments . To witness the approval, click here, find the “MP4 Video” for this particular City Council meeting, and fast forward to 233:15. Don’t blink, or you’ll miss it! The approval is documented in the Minutes (on p.13 of 18: item 8.4). Feb. 25, 2016 – A staff report entitled “Growing in the City” was tabled at a meeting of the City’s Governance and Priorities Committee, as Item 6 on the Agenda. The revised Boulevard Gardening Guidelines were attached to the report as Appendix G. The revised Boulevard Gardening Guidelines differ from the Interim Boulevard Gardening Guidelines in two key respects: the word ‘interim’ is gone, and section 6.2 is new (regarding abandoned or persistently unsafe gardens). To watch a staff presentation and the Committee’s discussion, click here, find the “MP4 Video” for this particular Committee of the Whole meeting, and fast forward to 65:20. The Committee unanimously recommended that Council adopt the revised Boulevard Gardening Guidelines, and that Council instruct staff to prepare associated Bylaw amendments (see “Main motion as amended” at the end of item 4.5, in the Minutes). 2015 – During the drafting stage, the Interim Boulevard Gardening Guidelines were shaped by public feedback in various forms, including direct consultations with boulevard gardeners, City Councillors, and community organizations. Just the same, additional public consultations were desirable. During 2015, the City engaged the public regarding the Interim Guidelines, and other food-growing initiatives. Online surveys, an open house and a policy review workshop were carried out, for example. July 24, 2014 (evening) – City Council approved the revised Interim Boulevard Gardening Guidelines. To witness the approval, click here, find the “MP4 Video” for this particular City Council meeting, and fast forward to 180:20. Don’t blink, or you’ll miss it! July 24, 2014 – A staff report regarding the Interim Boulevard Gardening Guidelines was tabled at a meeting of the City’s Governance and Priorities Committee, as Item 9 on the Agenda. The Committee gave direction to staff regarding revisions, and made a unanimous recommendation that Council adopt the revised Interim Guidelines. To watch the 34-minute discussion, click here, find the “MP4 Video” for this particular Governance & Priorities Committee meeting, and fast forward to 314:44. July 23, 2014 – CFAX 1070 interviewed Michael Large regarding the proposed Interim Guidelines. To listen to the 22-minute interview, click here, and fast forward to 07:20. July 10, 2014 – In anticipation of a staff report, three boulevard gardeners made presentations to City Council in support of the proposed Interim Guidelines. To watch the three presentations, click here, find the “MP4 Video” for this particular City Council meeting, and fast forward as follows: Michael Large gave the first presentation (at 148:06); then Margot Johnston presented (at 162:12); then Rainey Hopewell (at 166:26). June 26, 2014 – The Interim Boulevard Gardening Guidelines were tabled at a meeting of the City’s Governance and Priorities Committee, as Item 18 on the Agenda. Councillors Marianne Alto, Lisa Helps and Ben Isitt had signed a motion to recommend that Council adopt the Interim Guidelines. The Committee discussed the document, then approved a staff request for time to prepare a staff report. To watch the 25 minute discussion, click here, find the “MP4 Video” for this particular Governance & Priorities Committee meeting (Part 2), and fast forward to 58:32, or review the Minutes (Item 11.3). April to June, 2014 – City Councillor Ben Isitt and boulevard gardener Michael Large began work on interim boulevard gardening guidelines. 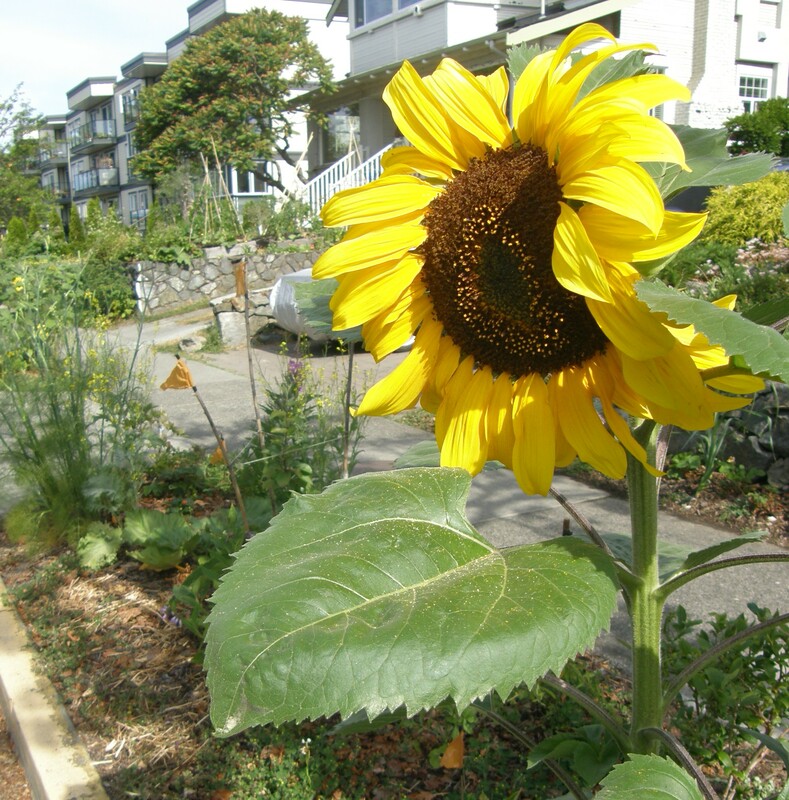 After online research regarding approaches taken in four different municipalities, the City of Vancouver’s Boulevard Gardening Guidelines were selected as a model. Those Guidelines were reworked to better suit the City of Victoria, with key contributions from local gardeners Rainey Hopewell and Jackie Robson. Each City Councillor was invited to review an early draft, and several Councillors provided comments. Twelve community groups were consulted, and representatives from six of those groups provided comments. 2012 – After two and a half years of public consultation with over 6,000 people, the City adopted a new Official Community Plan. Boulevard gardening is consistent with many of the objectives set out in the Plan, including planted boulevards (OCP 8.22.4); innovative food production (17.9); urban food supplies (17.A); food education (17.B); memorable places (8.a); native plants (8.58); connecting people to food (17.5); local food security & sustainability (17.9, 17.A); and adaptive management (22.1). 2010 – Bylaw #09-079 was amended by Bylaw No. 10-061, in part to crack down on camping and related activities on boulevards. For example, under subsection 103A(2), a person must not place any structure or thing on a boulevard without the written permission of the Director of Engineering. Under subsections 103A(7) & (8), a person must not cut turf or flowers, or remove them from a boulevard, without a permit from the Director of Parks or an agreement with the City. However, the City has shown little interest in enforcing these Bylaws against those who boulevard garden safely and responsibly. 2009 – Streets and Traffic Bylaw #92-84 was repealed and replaced with Streets and Traffic Bylaw #09-079. Section 84 (prohibiting damage to grass on boulevards) does not appear in the new Bylaw. Aug. 2003 – The earliest reference I could find to boulevard gardening in a City document appears in the Greenways Plan (p.23, section 10.1). By mid-2003, boulevard plantings were already common enough to catch the City’s attention. The Greenways Plan pledged to establish gardening guidelines and amend City Bylaws to permit the practice. 1992 – Section 84 of the City’s Streets and Traffic Bylaw #92-84 read as follows: “No person shall at any time destroy, damage or injure any tree, shrub, flower, foliage, grass or other growing thing upon any boulevard.” It appears that this prohibition governed until 2009.